This workshop is a complete video course about the DAX language. DAX is the native language of Power BI, Power Pivot for Excel, and SSAS Tabular models in Microsoft SQL Server Analysis Services. 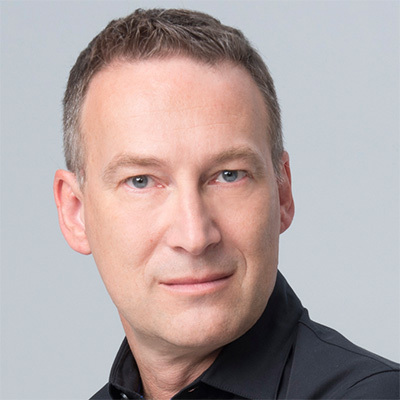 The training is aimed at users of Power BI, Power Pivot for Excel, and at Analysis Services developers that want to learn and master the DAX language. The goal of the course is to teach all the features of DAX, providing the knowledge to write formulas for common and advanced business scenarios. The course is made of more than 10 hours of lectures, and other 8 hours of individual exercises. You can watch the videos at anytime and the system will keep track of your advances. Within the course you can download the material for all the exercises. thank you very much! very detailed and helpful! Generally, I think that the course is good. It could be improved to be excellent by adding more detail in the exercises and their solutions. For example, although most tables and pivot tables are obvious to set up, some are not. So, clear descriptions of which fields to use for the rows, columns, and values would improve the courses. In addition, explanations, perhaps in the form of comments in the DAX code, describing the rationale and logic for the solutions would be good (e.g. why something had to be done a specific way). – Thanks for the feedback. In a few weeks we'll release a new version of this video course (and you will get automatic access, of course), which will include a brand new set of exercises. We considered all the feedbacks we received and while we are not able to satisfy all the requests, I hope that you will enjoy the new format. This course teaches DAX by a theoretical and a practical point of view, clarifying DAX inner working aspects, when needed to understand its behaviour. The teachers' exposition is very clear and their knowledge of the subject is astounding. Excellent course! Great balance between theory and practise. The only thing I found hard was to compare my own solution (if different from the given anwer) to yours. I assume my solution would be less good but why? And how would it compare in terms of performance. Perhaps providing different solution would be helpful in that case. 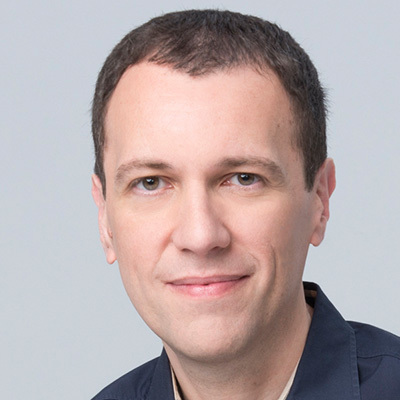 Excellent Course, I have been using Power BI for a few years now and wish I had taken this course from the beginning.... "Would have saved me many sleepless nights"
This exceptional course provides 10 hours of high quality video tutorials. All the concepts of DAX are explained in detail and in a comprehensible and pleasant way. 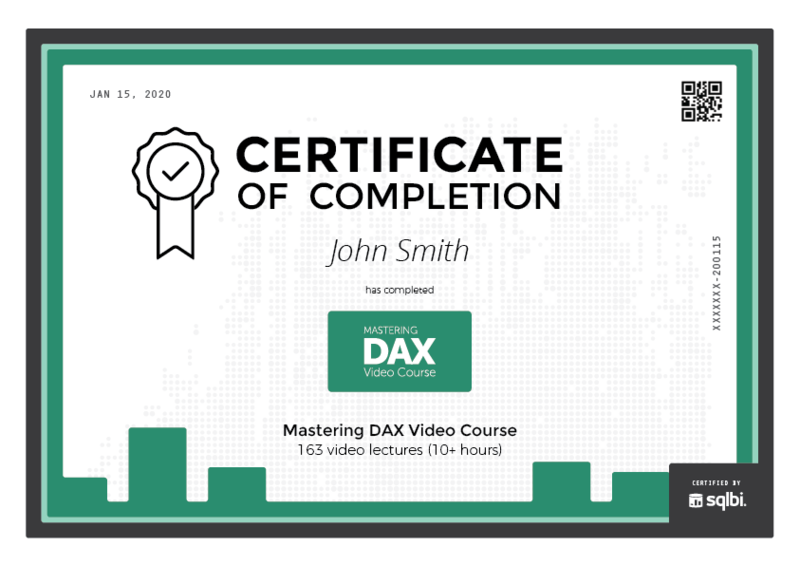 To sum it up: This course the way to go if you want to become a DAX master. Thank you very much for creating such great content! The only point that could be improved in my opinion: Provide more exercises. The contained labs are very good and I think working through them helps the most to really learn the DAX language. But there are so many functions introduced in the course that are not used in the labs. Having a larger set of exercises (including the solutions) would help to dive even deeper in the DAX world. Apart from that: GREAT WORK! Before the course, I knew nothing about coding in DAX. The course instructors and content were clear, relevant, and accommodated a variety of skill levels. Also, the labs are helpful to practice and recall what I learned. After completing the course, I am already using DAX to solve common data challenges. I enjoyed the DAX programming. The course is very dense, as I expect but the many growing concepts and the hard exercises are in a level that not correspond to the video classes. Video classes are easy and in a lower level presented. Perhaps , as a suggestion you could send us videos about the exercises resolution. The forum in that case is not enough. I realized that was a "jump" between the classes and exercises. Intermediate exercises between them could be another strategy to consolidate the concepts before going direct to the complex exercises. – Eduardo, thanks for the feedback. Any example of intermediate exercises would be useful - we know that we have several exercises that we consider basic or intermediate, and we can imagine what you consider advanced, but a more detailed explanation would be very useful for our evaluation. Thanks! Thank you so much for this course. Alberto and Marco are really the best teacher you can get to teach you DAX. I had already 1 year of experience with Power Pivot but this course helped me a lot to understand all the works under the hood. I will definitely buy their book in the next months. Thanks Alberto and Marco for this. I bought the Book (Definitive Guide to DAX) in 2016 and started reading until advance filter context and then thought I want to learn from Video. The Video was a great boost for my dax knowledge. Very good presentation. It satisfied my requirements. I have gone through all the topics by one week and will refresh it from beginning again . From last few months I was doing projects for my company on Power BI with few DAX equations like SUM , SUMX and few equations with Filters, now I will be able to use the power of DAX to provide powerful reports. Once I refresh the course and able to practise it , I prefer to take the DAX Optimization course. Once again thanks for the good presentation. The Best DAX Course in the World! This course is definitely the must-learn if anyone wants to use Power BI in a proficient way. From my own experience, it would be more efficient to follow the course and at the same time read the book . I appreciate that Marco and Alberto answer to all questions I posted on the web with as many details as possible. Thanks a lot and keep up the terrific work! Not enough real world examples. None of the examples will ever be used in the real world so it is very difficult to learn something when it is not taught correctly. My suggestion, don't give us some stupid unrealistic examples to work with, give us real examples that relate to real business needs. Not once do you provide examples of using dates to filter multiple tables or how to create relationships that calculate balances etc.... Everything is just a real water downed single table. – The examples included in the course are intentionally focused on explaining how the DAX language works. For this reason, they isolate specific issues that can help to understand each behavior of the language and of specific functions. If you want to get more real-world examples, we suggest you to take a look at www.daxpatterns.com where you can find a number of templates (completely free) that can be applied to real world issues. On that site, the focus is to apply the language to the business, so you will not find there an explanation of how the language work, which is probably needed when you have to adapt a pattern to your specific scenario. Thanks for your feedback, it will help us in clarifying the goals of the course in our marketing content. I've been using and learning DAX over the last three years. This course helped highlight the concepts I needed to advance my understanding over and above what I already knew of evaluation context and the subtleties of how the engine works. Thanks!! This is a fabulous course. I spent many hours with The Definitive Guide to DAX and still struggled to write the formulas I needed. Finally, I took this course. Marco and Alberto have built a course that takes you from the very basics and has you writing complex formulas by the end. The course is filled with real-world examples of calculations you can use. If you struggle at all with DAX, this course is well worth the investment. Finest course I have ever purchased. If your want to learn DAX it is a must. SQLBI is the leading company in BI nowadays! The material provided and the expertise of Maestros Marco and Alberto are unmatched. After reading "The Definitive Guide do DAX" and attending the DAX Workshop in London, I have no doubt this is the best course available today. I'm also enjoying the new course Power BI Dashboard by SQLBI. One of the most effective video courses that I've ever taken. Very well organized, wonderfully communicated. Well done! Essential material if you want to learn what happens under the hood of Dax. When you are using Dax and you are unable to explain the results you obtain in your pivot tables, this is the course to follow! Crystal clear explanations, very good exercise labs and discussion boards that are closely followed, whenever you have questions. The quality of the videos is of the highest standard and it is no coincidence that all users are giving the course a 5-star rating. If you are working with Dax, this course will teach you everything there is to know and then some more. Thank you Marco and Alberto, hope to see many more video courses from your team in the future! Best Course Ever Taken !!!! Marco Russo and Alberto Ferrari are consummate and masterful teachers and presenters. The course materials are organized expertly with a gradual progression towards the more complex. While intellectually challenging, Marco and Alberto manage to keep your interest with applicable examples and explanations - and some humor mixed in. Even though the course covers a vast space of DAX concepts, I would strongly recommend buying "The Definitive Guide to DAX" as a companion to the course and for further in-depth study. Bravo to you both! Master DAX from the Masters themselves! This is the video equivalent of the Mastering DAX Workshop training. The DAX masters themselves, Alberto Ferrari and Marco Russo, teach the course together. It is very organized and well thought out. There are video lectures and an associated exercise workbook to reinforce the material. All the sample Excel files can be downloaded, along with the lecture slides. Video lectures are guided by the slides, and include demonstrations of the DAX concepts using PowerPivot. Questions can be posted and the authors will answer them! Alberto and Marco provide in depth explanations and insights to the inner workings of DAX. They also give recommendations based upon their years of experience working with DAX. This is exactly what is needed to become a DAX master. I am extremely pleased with this video course. It offers tremendous value for the price and I highly recommend it to anyone wanting to attain DAX Master status! How can one train better DAX? Amazing - in my view this team is unbeatable when it is about SSAS Tabular or DAX training. I love the clear concept & perfect format of this DAX course. Alberto & Marco are pointing out each hurdle that may pop up by applying DAX formulas, supporting your learning curve with online samples discussed from different angles and great accompanying self-training material. This training contains 162 lectures for a total of 10 hours of videos. Our platform tracks your progress and resumes the course from where you left off. If you want subtitles in other languages, please submit your suggestions to us – we will consider including more languages in the future, according to the requests we receive.